From this nice answer one can import pretrained NN models and structures for state of art models. Is it possible to change ports inputting tensors to these Mathematica defined encoders? If so, how? In addition, I would like to know if it's possible in the inception model to change the number of output classes. Currently, I want to use the structure but not pretrained model with 1008 classes. Lets say I want 10 new classes for output. How can I modify DotPlusLayer("fc1"), SoftMaxLayer("softmax") and Port "Output" for this 10 classes? This network accepts images in resolution 299x299. If we want to keep neural architecture but change the number of classes (for example, add 10 new), we can trim original architecture using Take. But this network should be trained again, because it doesn't keep information about previously learned classes. 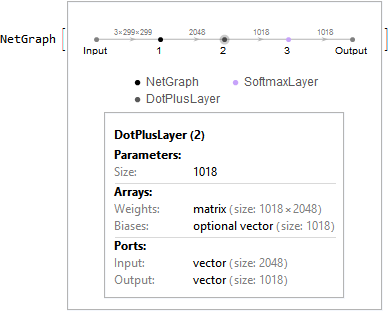 Neural Networks: Does Mathematica (v11) experimental code support state-of-art Models? How to implement the same function use *Layer function?